Aloha from the Ko Olina Resort. Its the rainy season here on the usually dry leeward side of Oah‘u, and weve had plenty of rain—but weve had beautiful days too. 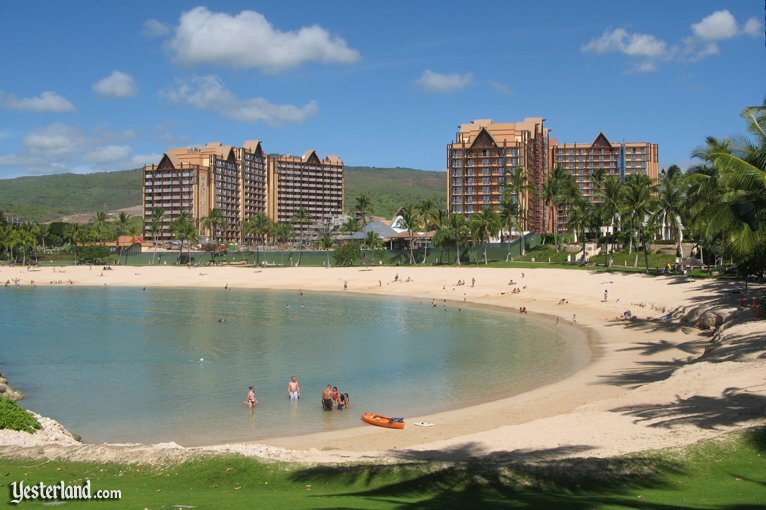 The official opening day of Aulani, a Disney Resort & Spa in Ko Olina, is August 29 of this year. I walked around the construction site with my camera this week. Im very impressed with what I saw. Lets begin with a view of the Ko Olina Resort from the ocean. 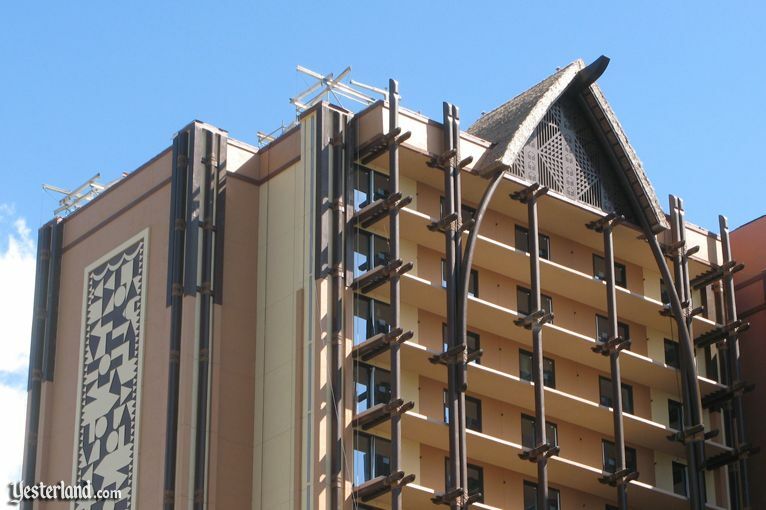 Disneys distinctive Aulani, with its thatched hut roofline and its warm earth-tone exterior, stands out among the beige towers that surround it. 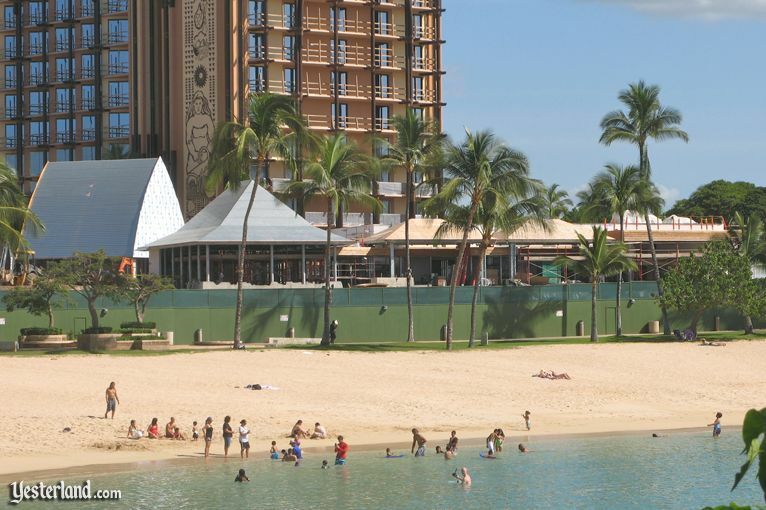 In this photo story, well look at Aulani from various angles. 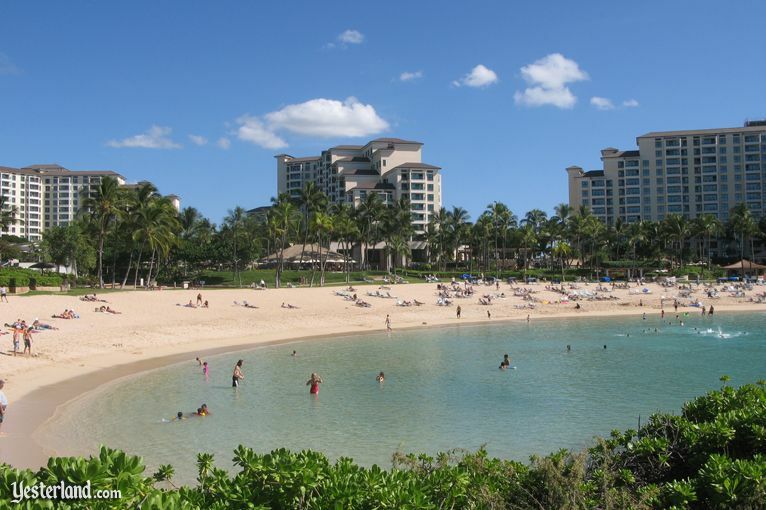 Instead of going straight to Aulani, lets start with a look at Marriotts Ko Olina Beach Club. 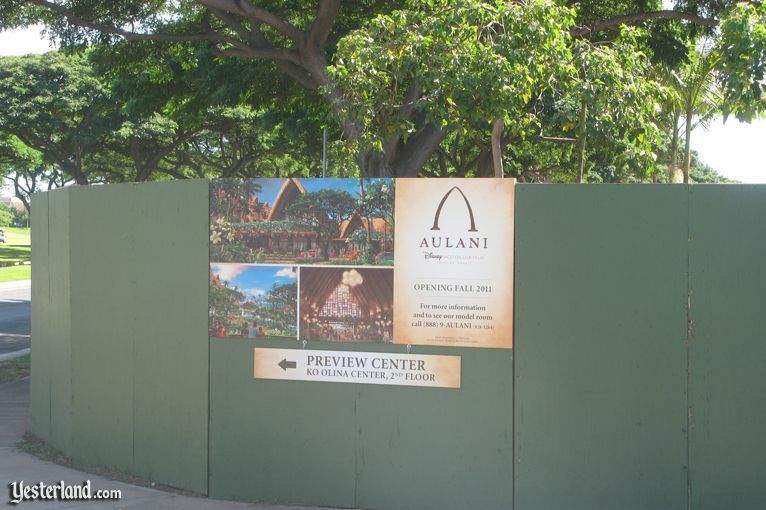 This timeshare resort—the competitor of Aulani—will eventually have 750 two-bedroom villas (lock-offs and dedicated) in four large buildings on 28 acres. First opened in 2003, three of its towers have been built, but one is only half finished inside. Notice the Marriotts architecture: simple, white balconies on simple, beige towers, topped by brown, pitched roofs. To avoid looking like giant boxes, the number of villas on each floor decreases as the height increases. Its a beautiful resort with friendly employees, but theres not much about the buildings that suggests Hawai‘i beyond the open-air lobby. Similar buildings would be right at home on beaches in Florida, Mexico, or the Caribbean. Thats not unusual. The architecture is practical, pleasant, and cost-effective. But such architecture is not good enough for Disney. From a distance, Aulani looks complete. If you look closer, theres still a lot of exterior work left—and, presumably, even more interior work. 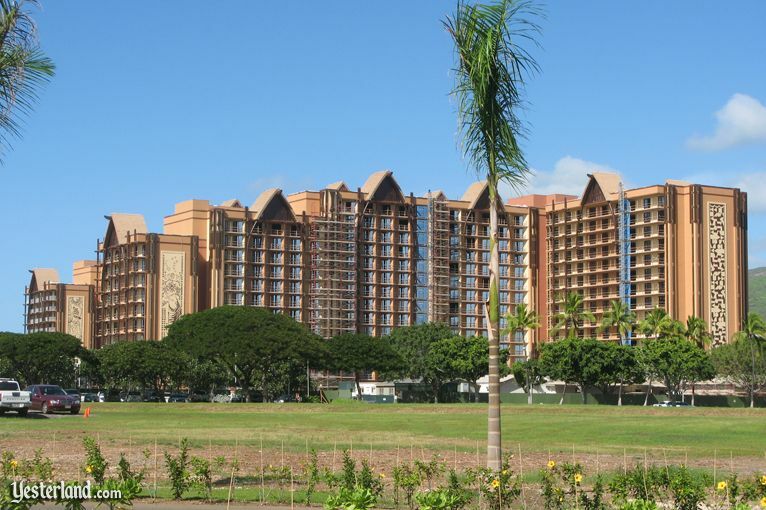 If youve seen read the Ko Olina articles that Ive published at Yesterland, youll recall a process that began with a ceremonial ground blessing and then continued with site preparation, basic steel framework, exterior wall construction, glass installation, and so on. By now, the work is in the details—architectural details, painting, exterior artwork, lanai railings, landscaping, paving, and pool area construction. 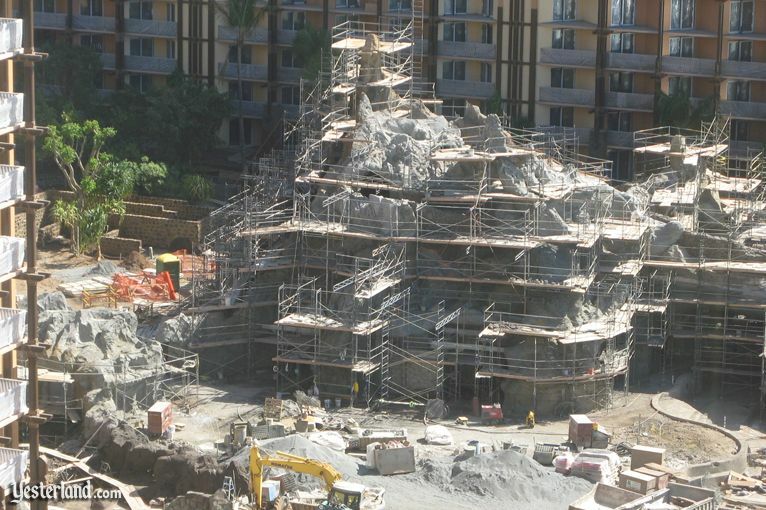 The following photos show progress—and remaining work—at Aulani. 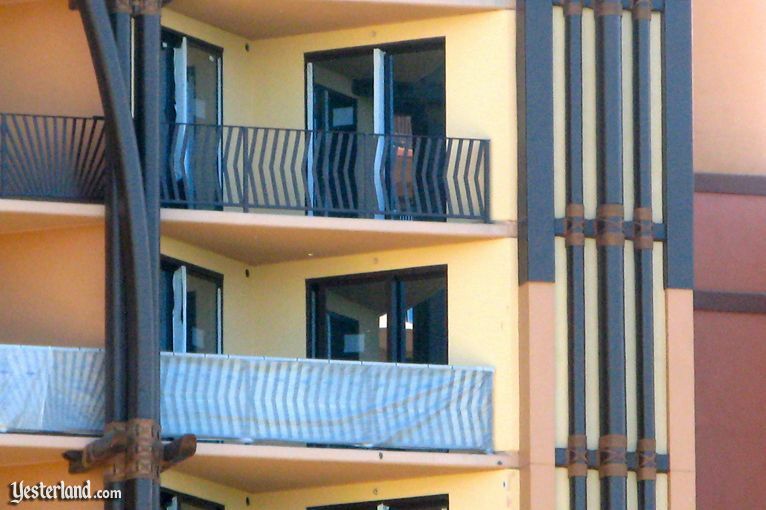 One place to see progress is to look at the balconies—lanais as theyre called around here. Some lanais have temporary wooden safety barriers; some have no railing at all, and some have finished railings, wrapped in protective plastic. The volcanic outcropping, Pu‘u Kilo, is part of the elaborate water feature at Aulani. An employee at the JW Marriott Ihilani said it looked like the Matterhorn at Disneyland to him. By the time its done, that should no longer be the case. Theres a backstory that explains why the ‘AMA‘AMA Beachside Restaurant has so many different rooflines. According to the story, the restaurant was a Hawaiian familys beachside fishing settlement. The oldest part goes back to the 1890s. The family added a second house in the 1920s and two more in the mid-20th-century. The newest part, a contemporary house, is quite recent. An old fish cleaning tank serves as a fountain, while sleek, modern furniture continues the mix of old and new. Its not simply an effort to be playful. Its about honoring a family—even if its a fictional family—that carries their traditions through generations. 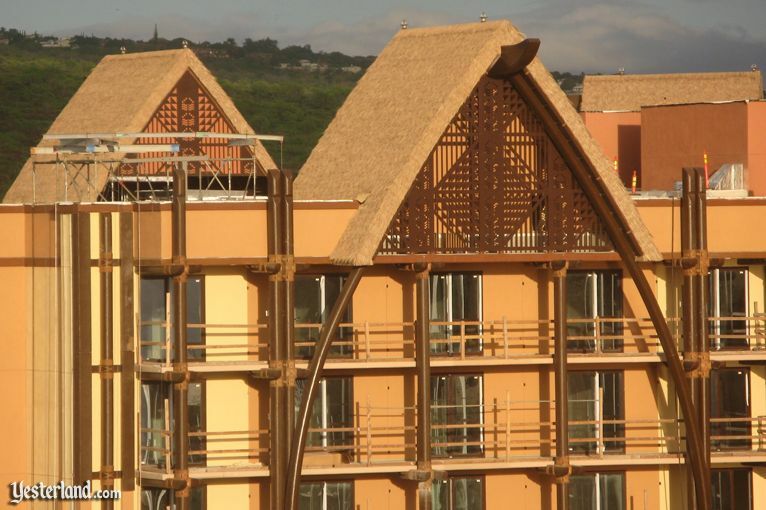 Eventually, grass thatch will cover the metal roofs, just as grass thatch has been installed over similar metal roofs elsewhere at Aulani. Aulani is separated from the JW Marriott Ihilani Resort, its neighbor to the north, by only a small public parking lot for beachgoers. 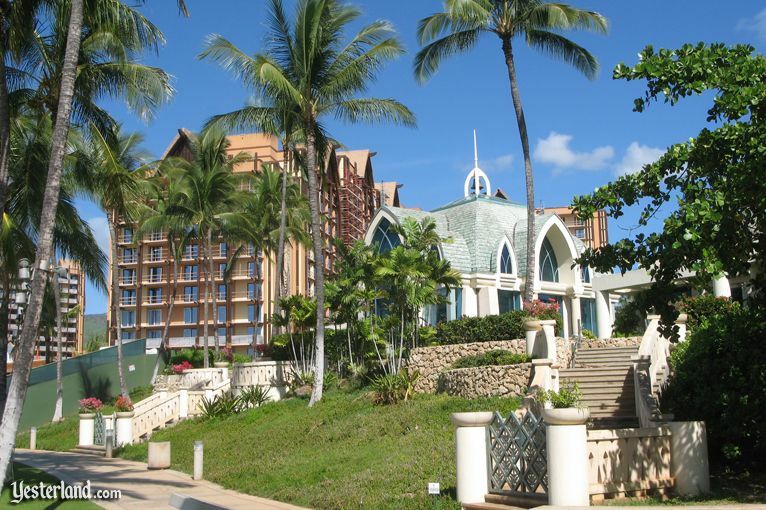 The Ihilani was the first resort hotel at Ko Olina. It opened in 1993 as part of the Nikko Hotels chain of luxury hotels owned by JAL Hotels Company, Ltd. The hotel changed hands in 1999 and was rebranded as a JW Marriott resort. Currently, about half the rooms at JW Marriott Ihilani Resort are out of service for a major room upgrade project. When completed, all 387 guest rooms and 36 suites at the AAA Four Diamond award winning resort will be completely refreshed with new colors, new furnishings, new fabrics, new artwork, new bathroom fixtures, and new 42-inch flat-screen LCD televisions. 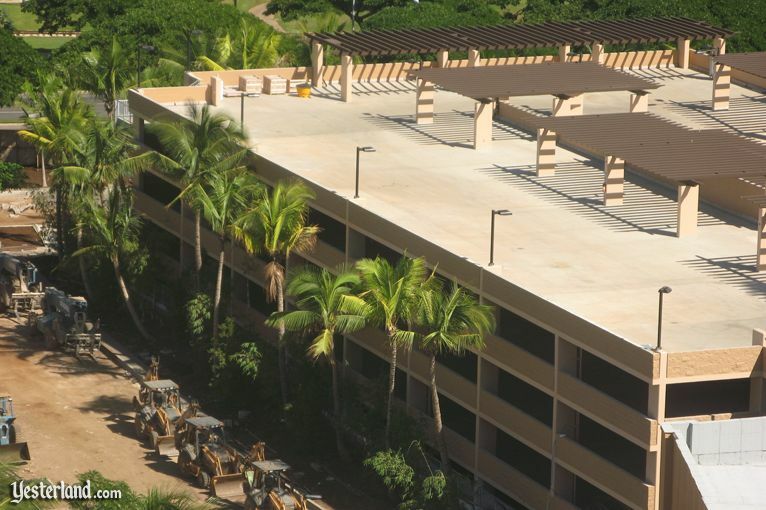 It seems the JW Marriott Ihilani wants to be ready for Aulani. Competition is a good thing. Another feature of the Ko Olina Resort that goes back to its earliest days is the wedding chapel on Lagoon 1. 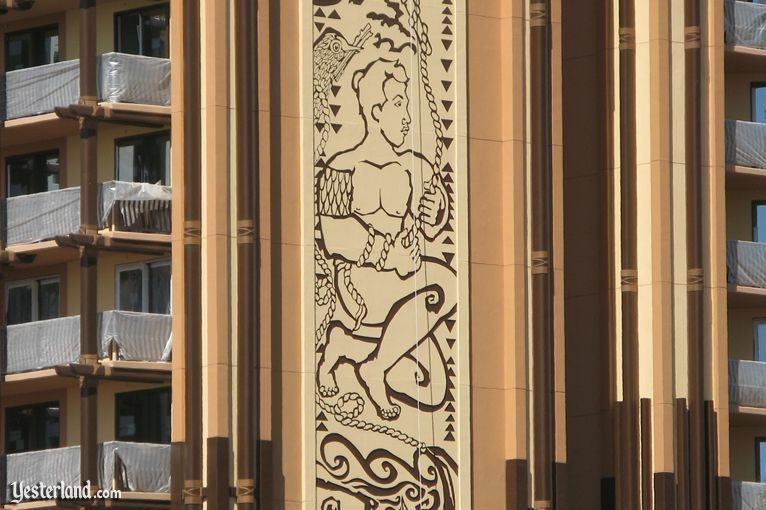 Sitting by itself for almost two decades, its now adjacent to the Aulani property. The Ko Olina Resort still has large, undeveloped parcels of land. Over the years, numerous plans were announced but subsequently fell through. These include a Ritz-Carlton resort, a Trump-branded condotel, and the Grand Ko Olina Resort (by the developer of the Grand Wailea Resort on Maui). The $1 billion Grand Ko Olina plan, announced in 2005, would have included an interactive aquarium—more like Discovery Cove than a traditional aquarium—partially paid for by a controversial $75 million state tax credit. 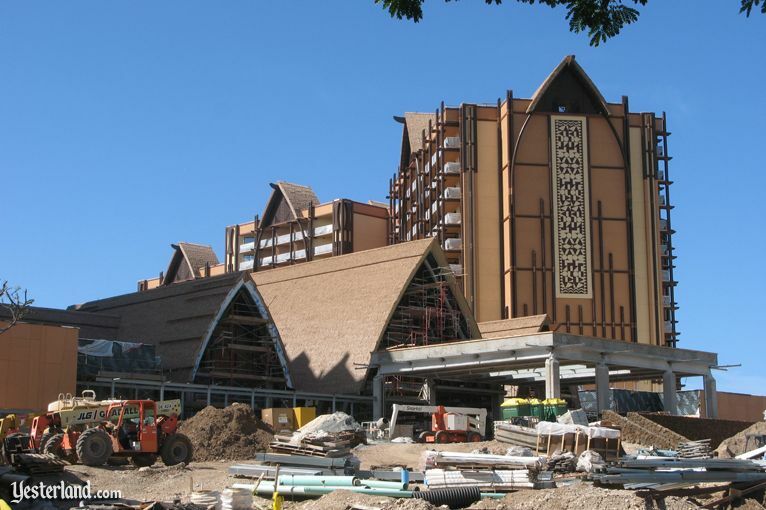 Aulani is not just the only resort construction project in Ko Olina; its the only major resort construction project in the whole state of Hawai‘i. Immediately south of Aulani, theres a parcel thats similar in size to the 21 acres that Disney purchased in 2007. At this time, its not spoken for. Eventually, its likely a developer will put up 15-story towers on that site for a resort hotel, timeshare, condo, or mixed-use project. The view from Aulani to the ocean should not suffer too much. One of the advantages of the master-planned Ko Olina Resort development is that there are setback requirements to protect ocean views. Speaking of the master plan and the vision for Ko Olina, theres sad news. Herbert K. Horita, the visionary Hawai‘i real estate developer who conceived the Ko Olina Resort in the 1970s died at age 80 on December 20, 2010. Where others saw remote sugar cane fields on an unremarkable stretch of rocky coastline near heavy industry and without a beach, Horita saw an idyllic resort with manmade lagoon beaches, golf, luxury hotels, a marina, and desirable residential neighborhoods. The project would require massive, costly infrastructure work before any hotel company would want to be there. Horita persevered, gaining approval for his plan despite opposition from several fronts and obtaining financing for the infrastructure and the first hotel from Japanese partners. 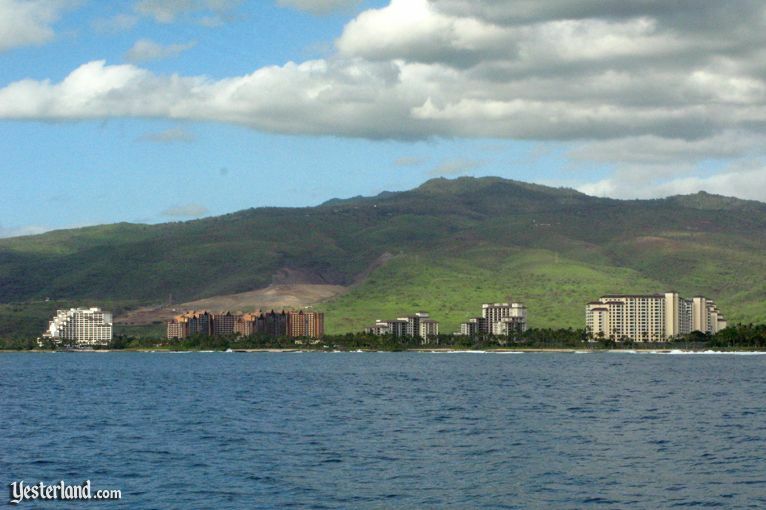 The lagoons, roads, golf course, and marina were built, but development stalled with a single hotel (the Ihilani). Then the Japanese investment bubble burst. 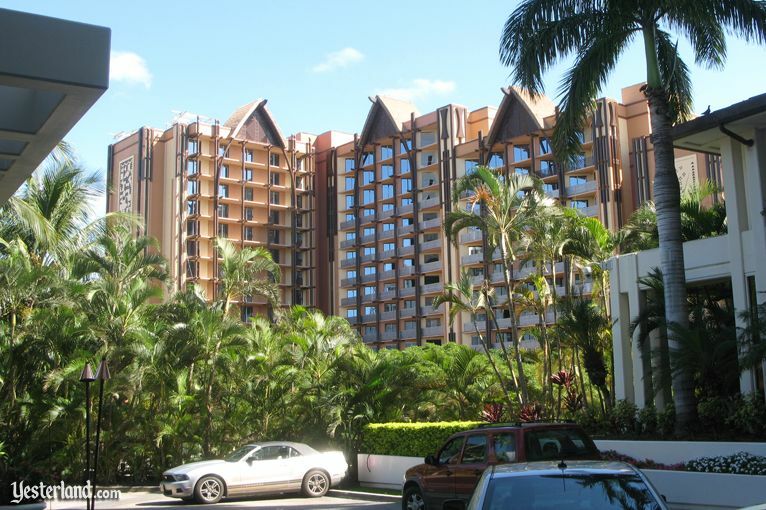 Horita lost control of the Ko Olina Resort in 1999. A new developer, Jeff Stone, took control. Although Ko Olina was ultimately not one of Horitas many financial successes, it was his grandest vision. 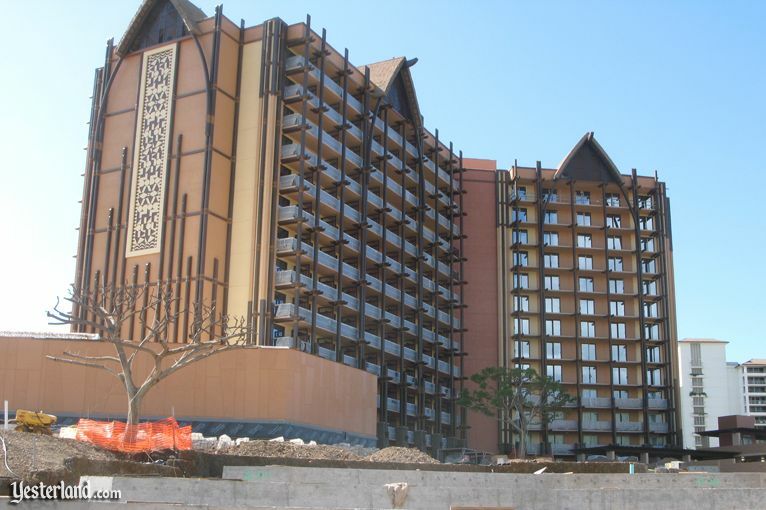 Its a shame that Horita will not see the grand opening of Aulani at the Ko Olina Resort. 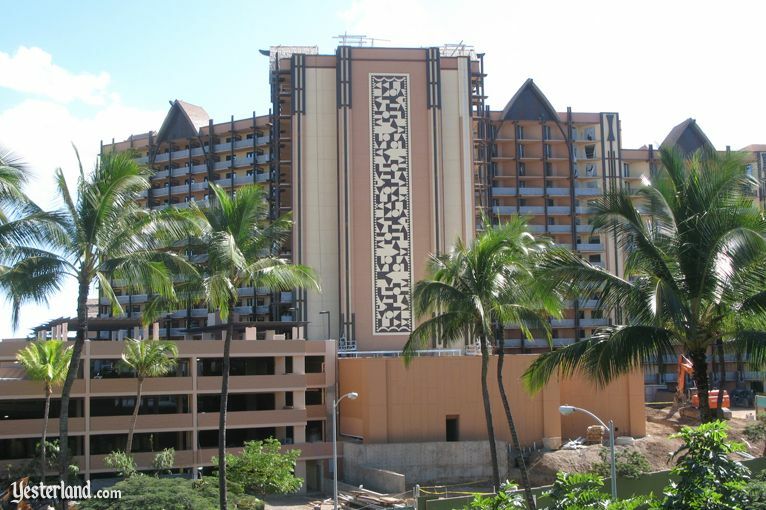 Photographs of Ko Olina Resort and Aulani construction: January 2011 by Werner Weiss.